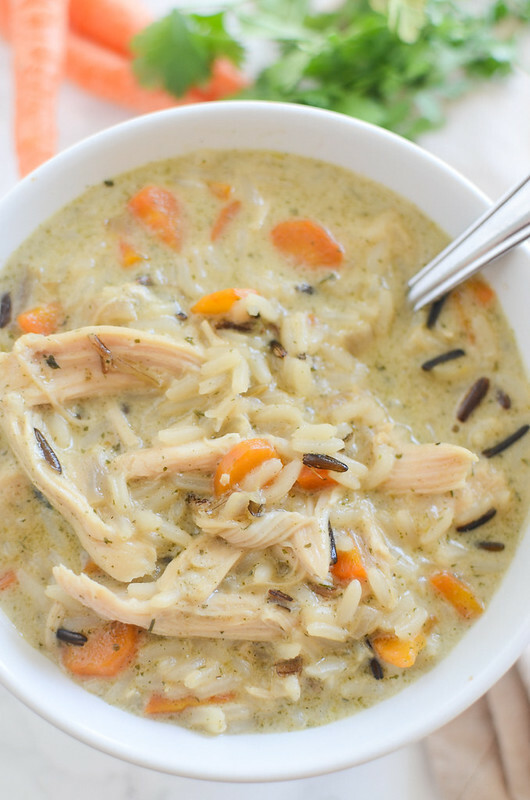 This copycat recipe of the Panera Chicken and Wild Rice Soup is so easy, so delicious, and you don’t have to leave your house to pick it up! Meet my current favorite soup. I’ve made it twice in the last few weeks. I don’t even like soup. But I could eat this every day for a month and not be sick of it. It’s supposed to be like the Panera Chicken and Wild Rice Soup but I can’t tell you for certain. I’ve never tried that one because I am too busy ordering the broccoli cheese soup. 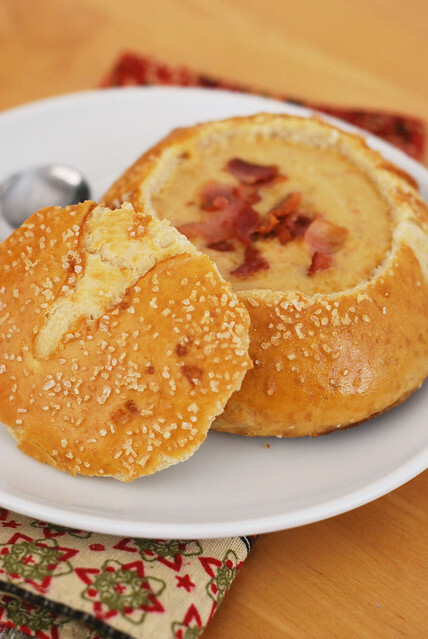 In a bread bowl. With an extra baguette. Because I really want to gain 20 pounds before bikini season. 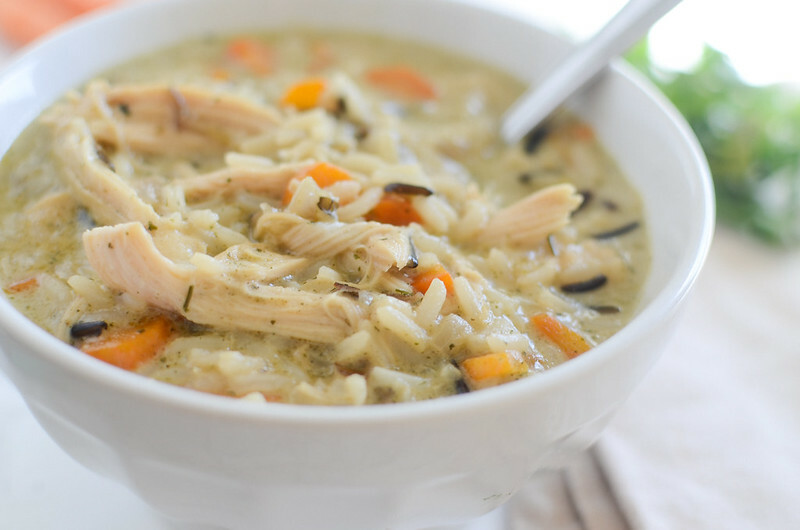 Okay, Chicken and Wild Rice Soup! 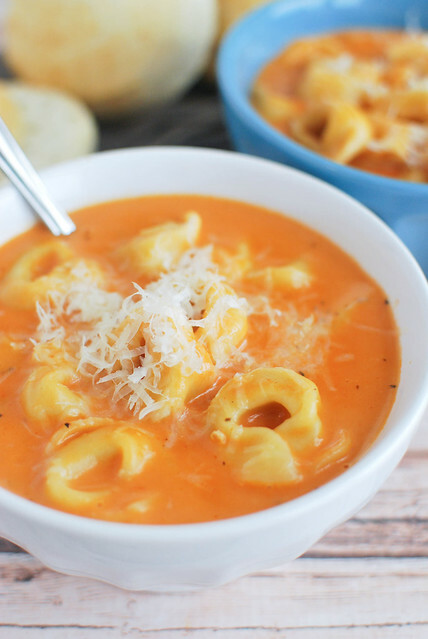 This is THE EASIEST soup you will ever make. And I make it even easier by grabbing a rotisserie chicken from the grocery store and just shredding it. Then you use a boxed wild rice mix (with the seasoning packet!) plus some fresh onion and carrot and let that all cook together until it’s bubbly and delicious. And then you stir in a bit of heavy cream at the end. Because why not stir in a little heavy cream?! So good. So easy. I’ll probably make it again next week. And the week after that. And probably every time it gets cold because it is the ultimate comfort food. Especially with some fresh bread on the side. Definitely double it if you are feeding more than a few people or want some leftovers. I’m even going to consider tripling it if I can find a pot big enough. It reheats really well so it would be perfect for making a big batch on the weekend and taking it for lunch all week long. Melt coconut oil in a large pan over medium heat. Add onion and carrots and cook until softened. Add dried marjoram, flour, and seasoning packet from the rice; stir to combine. Add rice, chicken broth, and water; bring to a boil. Cover, lower to a simmer, and let cook for 15 minutes. Heat heavy cream and milk in a small saucepan over low heat. Stir into the soup. Stir in the shredded chicken. Cook about 30 minutes or until the rice is cooked. Season with salt and pepper to taste. 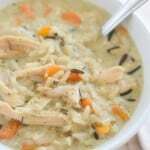 25 Responses to "Chicken and Wild Rice Soup (Panera Copycat)"
can you use any wild rice w/a seasoning packet. I don’t think they have that brand at my grocery store. Thanks. Looks delicious. This soup is excellent. My 17 year old daughter is down with a bad cold. I was looking for a chicken soup recipe to make for dinner as she has been wanting soup. This soup was a hit with the whole family. We will definitely be having it again in the very near future. Yay! So glad to hear it! I need to make it again soon – it’s my favorite! This is supposed to be similar to Uncle Ben’s boxed wild rice seasoning packet! can you freeze this? if so, how? thanks! Sarah, I know you asked this a while ago, but I always freeze this soup. It does very well. I sometimes freeze 4 servings in a reused plastic yogurt carton or I’ll freeze invidual servings in my jumbo muffin tin or mini cake tins. Once they’re frozen solid, I take out of the freezer, let them thaw for like 3 minutes, and then pop them out of the tins and transfer to a ziplock or a freezer container. Can you freeze this? If so, how? 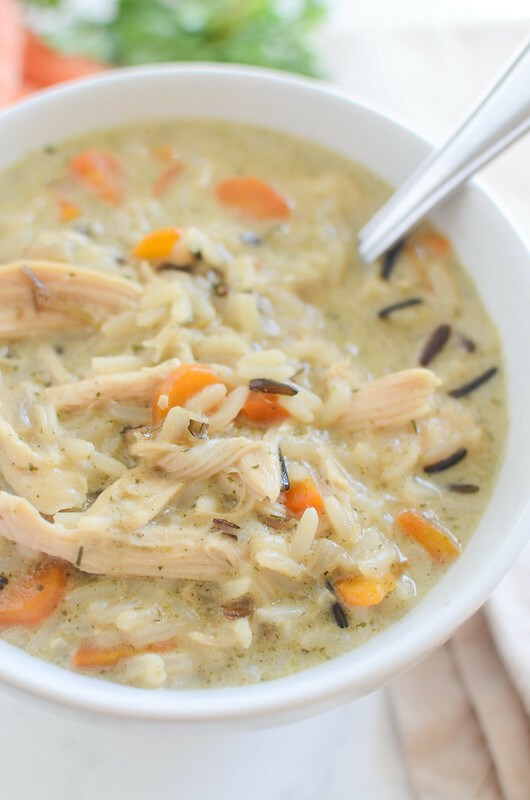 I’ve made a version of this soup before…if you’re in Canada like me (Barrie,ON) Uncle Bens Fast & Fancy fine herb and wild rice works perfect for this. It has the separate flavour pack as well. And it eliminates the need for any additional salt. Can you use anything else besides coconut oil? Making this soup for the 3rd time since I found the recipe back in October. It is so cold and blustery out tonight and this is a very filling soup that will definitely warm my family. I am so grateful that I found this recipe. It has become one of my favorite soups. Thank you so much for sharing this wonderful recipe!!! How much rice is in one package? Incase I wanted to use different rice, like 1 cup or so? 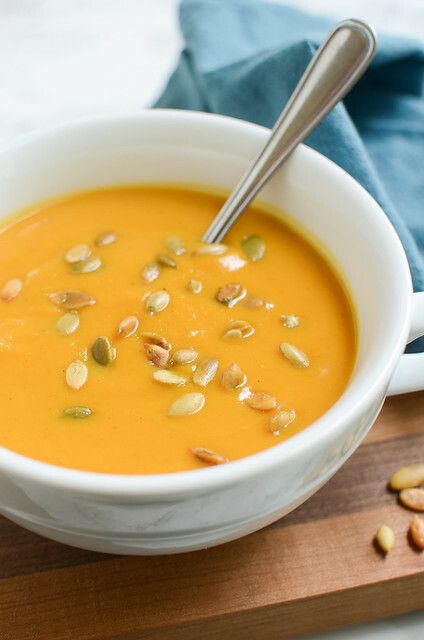 I’m making this soup tonight, it’s blizzarding outside, and was just curious if you know how much a serving is? I know it says it serve four but am trying to be more specific as I am doubling the recipe and want to log it in my food diary but am unsure how much I should count as a serving. Made this last night, it was wonderful, thank you! I never made Rice soup before. But this recipe looks delicious, I want to have a try. Thanks. I have made the “long” version, where you cook the chicken and this one that you don’t. Both are great, but this one is easier. I did add a few more veggies; extra carrots, celery, celery leaves, onions, spinach & a touch of garlic and pepper. I also used a little cornstarch slurry to thicken it. Wonderful! I had never eaten this at Bread Co (Panera) before I made it. After my first batch at home, I ordered it at the restaurant – this recipe is MUCH better!! Great soup! Makes alot more than 4 servings, maybe 6 to 8 servings. I used 1 package of Uncle Ben’s Long Grain and Wild Rice (Fast Cook) and 1 more cup of chicken broth. I know it’s the middle of summer but I was craving this soup. First time I made it and we all loved it. Thanks! Oh, and I’m thinking about squeezing a lemon over my next bowl full.